Please note, this offer has now ended. 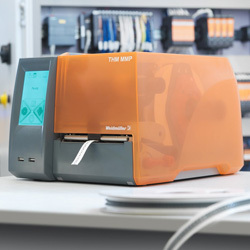 The Weidmuller MultiMark printer provides cost effective printing for modular terminal block, conductor, cable and device markers, making it easy to identify each component and cable in your control panel. Where first impressions count, it also gives a professional finish to your wiring. The printer edits markers and labels from the MultiMark family as well as continuous materials, textile and polyester labels, heat shrink sleeves and PLC labels. Snap-on terminal markers are printed using a separate print contact presure roller, which can be changed in just 30 seconds. The printer is very easy to operate with an intuitive touch display and clear status indicators – in 22 languages. It's compact design and low weight of 3.5 kg also ensures the MultiMark can be used anywhere, even as a mobile printer for on-site jobs. The MultiMark printer with intelligent cutting and perforation option processes markers and labels from the MultiMark range, as well as continuous materials, textile and polyester labels, heat shrinkable sleeves and PLC labels. Its intuitive operation, compact design and weight of just 3.5 kg mean it can be used anywhere. Weidmuller TM-I and WM conductor markers and SFX cable markers provide clear labelling of conductors and easily cables to identify different circuits to be identified without doubt. The range is perfectly tailored to all normal conductor labelling functions. If you would like more information about the Weidmuller MultiMark printer, or this fantastic special offer, please download more information on the right or call our Head Office Sales Department on 01254 685900. We'll be happy to help. 1. Offer is limited to 1 printer per customer. Customers who peviously took advantage of this offer can participate (see paragraph 7). 2. Offer available until end of June 2018. 3. Order value is nett prices & before VAT. 4. The offer is valid for both direct customer and those who purchase via our franchised distributor network. For non-direct customers, they will need to issue details of qualifying orders to Weidmuller UK. e.g. order confirmation or invoice. 5. The offer is not available via non-franchised partners. 6. Orders must be placed as a single order for one time delivery, no call offs. 7. Order must be for new Weidmuller business i.e. products not purchased by the customer in the previous 12 months.